Arizona Center, Phoenix’s original downtown entertainment destination located at 3rd St. and Van Buren, will undergo a significant transformation. 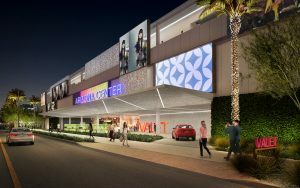 Acquired by Parallel Capital Partners and Angelo, Gordon & Co. in December 2015, the new Arizona Center will embark on a $25 million makeover in 2017. Scheduled to break ground in early 2017, the project will take approximately nine months to complete. All current tenants will remain open during the renovation. Arizona Center Visitors will now have the option to use the new valet parking entrance on 3rd St. between Van Buren and Fillmore. “Adding more points of entry such as valet parking, will allow visitors, workers, students, and downtown residents to access shops and restaurants with ease, and will create a more dynamic experience once there,” added Root. The joint venture of Parallel Capital Partners and Angelo, Gordon & Co. paid $126 million for the 16-acre multi-use complex with entitlements for an additional 3.9 million square feet of improvements. Other developable sites on the property will potentially to double the density and vibrancy of the center and may include a hotel, office and retail space, education buildings, multi-family housing, and other community spaces. The architect for the project is Gensler, the world’s leading collaborative design firm. PdO is working on the interior redesign for One Arizona Center and Smith Group JJR is supporting development strategies for the entire property. The branding and PR firm is Tempe, Ariz.-based, Zion & Zion.